Egglettes Reviews - Is it a Scam or Legit? Using a two-piece design, Egglettes promises to help you make perfect hard-boiled, soft-boiled, and mini-omelet eggs in minutes, without worrying about messy shells and broken egg whites. Just crack the egg into the nonstick silicone pod, twist on the lid, boil on the stovetop, and pop them out when done. Then, when you’re finished cooking, their dishwasher safe design promises to make cleanup super easy. The basic idea behind Egglettes seems fairly straightforward. But does that necessarily mean that they’ll deliver on the manufacturer’s claims? Even then, are they the only option available? Let’s start answering your questions by going through a quick cooking lesson. In a nutshell (or eggshell, as the case may be), this is the ‘thermodynamic’ process referenced on the Egglettes website and in their commercial. As anyone who’s ever boiled an egg understands, though, this chemical change can cause the egg white to stick to the inside of the shell, making it tough to remove without spending precious time and creating a mess in the process. Compared to these—often free—methods, let’s find out what you’ll pay for Egglettes. How Much Do Egglettes Cost? Idea Village backs Egglettes with a 60-day refund policy, less S&H, which you can request by reaching out to customer support at 855-355-0416. Let’s learn more about the company you’ll be calling. What Do We Know About Egglettes’ Manufacturer? Egglettes seemed to be a brand new product at the time of our research, although we encountered two customer reviews on Amazon, one of which gave them a five-star rating (ease of use, great results with practice), while the other rated their experience one star (priced too high). From a company perspective, Idea Village is based out of Wayne, NJ and has been manufacturing As Seen on TV products since 2009. Some of their top-reviewed products here at HighYa include Copper Fit, Yes! by Finishing Touch, Micro Touch One Razor, and Snackeez. Idea Village held an A+ rating with the Better Business Bureau, based on four consumer reviews and nearly 100 closed complaints, as of 1/22/18. Most of these appeared to revolve around products that didn’t meet expectations, along with difficulty obtaining refunds. A representative responded in each instance. Are There Other Devices Like Egglettes? While we encountered several related products during our research, such as electric steamers and poached egg holders, the only similar option to Egglettes we came across was Eggies. This four-pack of holders featured a meaningfully different design than Egglettes, although they offered the same core functionality—just crack the egg into the container (and pre-season it, if desired), boil, and then untwist the cap to remove the contents. Eggies didn’t come with a bonus microwave egg sandwich cooker or free recipe booklet like Egglettes, but it did include a free egg white separator. Price-wise, online retailers offered it for between $9 and $25, putting the product in question meaningfully lower, depending on retailer. 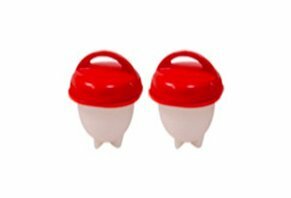 We don’t typically include feedback for third-party products in our articles, but given the essentially identical function in this instance, we think it’s worth pointing out that many Eggies customers complained that the devices tended to leak their contents into the surrounding water. Also, due to the elbow grease necessary to clean them after each use, many customers stated they didn’t seem to save much time compared to traditional boiling and peeling. Pro tip: To potentially help alleviate the latter problem, one Amazon reviewer recommended that you oil the inside with some cooking spray prior to use, although your mileage might vary. Outside of price and real-world functionality, is there anything else you should keep in mind when choosing between Egglettes and the competition? In the end, we didn’t test the device ourselves. But based on what we learned during our research and from online customer feedback for functionally identical competitors, it seems that Egglettes could live up to its claim of helping you never have to peel a hard-boiled egg again. However, you'll still have to crack the egg, which could introduce eggshells into the cup if you're not careful, so it certainly won't eliminate them altogether. Also, based on the limited online consumer reviews for Egglettes, it might take some practice before perfecting the necessary technique. Together, we think you might want to maintain realistic expectations about what you’ll experience as soon as you try them. Whether or not you’re a professional right out of the gate or otherwise, just keep in mind that it’s not a completely risk-free transaction if you’re not satisfied, since `you’ll lose your initial $3.99 S&H. You’ll also have to pay to ship your Egglettes back to the manufacturer, which could vary greatly depending on where you live. I am not able to get the egg out of the container as on TV. I cook in boiling water and they are not firm in the container. They are now in the back of my cupboard. Very disappointed in this product. Egg white sticks to the silicone. What a mess trying to get it out of the egglette. The old fashioned way is better. Waste of money! I tried these several times and got the same result. If you use a dinner knife to scrape the egg out and partially clean the silicone, it takes a while. I had to turn the Egglettes inside out to clean them. Sticks to silicone, you get mess of eggs. Eggs stick to the silicone shell and it is difficult to clean it. Because eggs stick to it, you get a total mess of egg. It takes much longer to cook the egg then normally. Also, they should specify a cooking time. Stick to the old fashioned way. I asked Santa for two packs, thinking one would go back. I don't eat eggs, but my husband loves deviled eggs, but hates getting the shells off. So I tried a 4-pack tonight and they were perfect. I Pamed the top and inside and you are to roll it around to spread. Forget that! Just spread the Pam with my finger and the top also. I was surprised 4 remained upright in the pot. Anyway, I cooked them in boiling water for 16 minutes like the book says - yes there should be a booklet! Next I drained them, kept them in the pot with cold water and ice. They popped out fine You may have to squish the sides a tad, but they do fall out. No shells - the hub ate them up! I won't put them in the dishwasher or use the other recipes. For a party, the shape isn't that great, but they show how to stuff them. I am not sure anyone would want to eat a full stuffed egg at a party. Anyway, a keeper for me to make the hub his favorites! I got these as a gift. Pretty simple design and work as they are supposed to if you follow the directions. Mine tastes great, and it really is much easier than peeling hard boiled eggs! Three of them repeatedly turn upside down. I really don't know why. All I know is that they don't perform the way they are advertised. If you mess using these up, don't blame the product. It's too simple of a concept and design to really complain about manufacturing defects. Will it be perfect every time? Nope. When does anything work perfect every time? Just practice and enjoy shell-free eggs. I bought a dozen of these useless things. Eggs stick to them and even cleaning them is difficult. You can’t time them to get soft or hard-boiled eggs. Eggs that you can get out of them without breaking are rubbery. It takes longer to set up and cook than traditional boiled eggs, even peeling difficult eggs is faster than these useless pieces of silicone. Don’t waste your money. After reading all of the negative reviews, I couldn't help but add my own review for those of you interested in an honest review. Just note that this review is intended for those of you who are rational, level-headed, and realize this product isn't a fine piece of cooking ware. A 4-pack costs $10. That is your clue #1, for you idiots who are/were expecting a perfect product and griping because it's not. For me, this is a good product. I made 2 rounds of boiled eggs and "omelets." Like others posted, the cups can flip over during boiling if you are using a large pot and are using TOO MUCH WATER. Even so, if the cup is sealed tightly, the egg will be fine. If not, yes, water will get in the cup. Easy solution: First, use the smallest pot you have that will accommodate the cups, whether it's 2 cups or 10. Secondly, use just enough water so that it's 2/3 high on the cups. Boil for 15 minutes or so, and you've got some pretty good eggs...boiled and omelet-style (with diced tomatoes, jalapenos, and cheese). This product is working great for me, but I also wouldn't be surprised if they broke or otherwise malfunctioned tomorrow. Again, they were $10. Set your expectations accordingly, people. I bought two packages of four from a local Walmart. When I got them home, it was more work getting things together than boiling the old way. Eggs still stuck even spraying oil. This company wasn't foretelling of the extra time of spooning it out, etc., the way the commercial shows the eggs just fall out. Baloney! If there was a lower score, I would've given it! These things are pretty neat, and I don't understand all the Egglette-shaming that I read. The Egglette is vented via a small hole in the plastic top to allow air, repeat, air, to escape during the heating process. If the Egglette tips over during the boiling, then egg material will squirt out the vent into the boiling water. So, don't let the Egglette tip over! Simply put enough water in a small pot to allow the things to sit on the bottom of the pot and up to a level below when they float. Works every time. My favorite recipe is to put some bacon bits and a small amount of sharp cheddar and the egg into the pre-pammed cup, close it up and then shake vigorously. Boil the cups in a rolling boil for a little under 12 minutes, squeeze the omelets out and enjoy. These things are the only food I know how to cook. Write a Review for Egglettes!